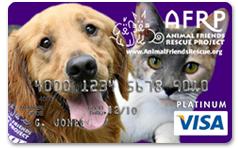 The Animal Friends Rescue Project credit card program has been discontinued. The information written below is strictly for archival purposes. Animal Friends Rescue Project is a 501(c)3 nonprofit organization supported by contributions from people like you. 0% Introductory APR on purchases and balance transfers for 6 months. Five different card designs to choose from. Earn points at hundreds of participating online and neighborhood retailers. Earn up to 15 bonus points per dollar at select merchants. $50 donation by the bank when you first use the card plus ongoing contributions. No annual fee and no additional cost to you. Enhanced Visa Platinum benefits, including 24/7 Emergency Customer Service and 100% Fraud Protection, Purchase security, Warranty Manager and much more. Animal Friends Rescue Project has been providing life saving services to companion animals since 1998. Your donation will help us continue to find good homes for abandoned, stray, and abused companion animals as well as help us continue our aggressive spay/neuter programs.